Check out some of the sweetest gifts the South has ever given. Mississippi Gift Company (based out of historic Greenwood, Miss.) has gift boxes, tins and towers for your candies, cookies, jellies, jams, preserves and more. Locally grown berries, nuts. Need an idea for Mother’s Day? The Mississippi Gift Company has got y’all covered. This basket includes everything to make mom feel special on her day: Peppermint Snaps, Cheese Straws, Chocolate Covered Pecans, a flower shaped lotion bar, a Soap by the Slice, and a luxurious Sugar Blossom Body wash. For Father’s Day, get Daddy a Mississippi Grill’n Bucket complete with Daddy’s BBQ sauce, Daddy’s BBQ Rub, Shapley’s Seasoning and Fit To Eat Sauce. 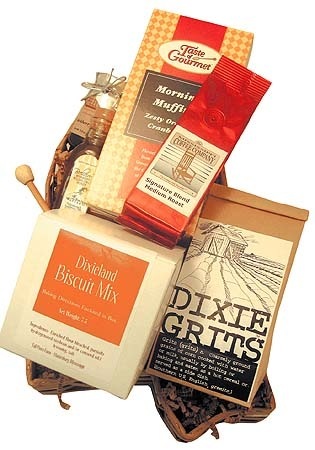 Any time you want to treat someone special, pick up a custom-made gift basket in the shape of Mississippi. Salad dressings, salsas, pickles, plus mixes for soups, breads and other concoctions. It’s a pretty present and tasty too. No more of the same old shortbread and cheese straws manufactured in a factory. Mississippi Gift Company uses family recipes for their tasty treats. Want to give something non-edible? The site offers jewelry, candles, books, posters, or even a bale of cotton straight out of Mississippi’s fields. Cookbooks from generations of the Southerners, bookmarks, calendars and stationary — how about that y’all. Giving someone a set of thank you notes in the fabulous gift basket you send them! That way they have no excuse not to write you. Every time the recipient uses their new letterhead, they’ll remember how awesome you are for using Mississippi Gift Company! These gift sets contain items handcrafted by more than 150 Mississippi gourmet food companies, entrepreneurs and artists. Since they opened their doors in 1993 they have searched Mississippi to bring y’all the best their state has to offer. The Mississippi Gift Company now carries over 750 food and gift items hat exclusively specializes in products made in Mississippi. 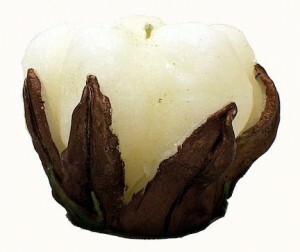 A state known for its cotton even made candles in the shape of a cotton boll. For more information, shop The Mississippi Gift Company’s catalog, like them on Facebook and follow them on Twitter. And if you ever want to make us happy here at Pretty Southern, now y’all know these are a few of our favoite things! How do I get in touch with the people who write for this blog?